Nat’s One-Sentence Synopsis: It’s 1946 in the Mississippi Delta region and life is a trial for the six narrators who tell of their own struggles with internal and external demons as they try to get ahead, get a foothold, get along, or just get by. Mudbound was recommended to me by Vivienne at Serendipity Teacher, and it was the first book in a long while that captured my focus. This novel was a Bellwether prize winner and embodies the requisites with a strong focus on “conscience, social responsibility, and literary merit”. 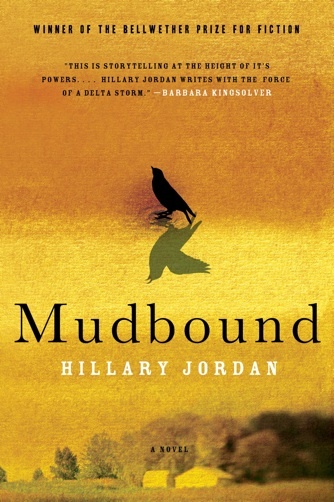 In 1946, Laura McAllan, a college-educated Memphis schoolteacher, becomes a reluctant farmer’s wife when her husband, Henry, buys a farm on the Mississippi Delta, a farm she aptly nicknames Mudbound. Laura has difficulty adjusting to life without electricity, indoor plumbing, readily accessible medical care for her two children and, worst of all, life with her live-in misogynous, racist, father-in-law. Her days become easier after Florence, the wife of Hap Jackson, one of their black tenants, becomes more important to Laura as companion than as hired help. Catastrophe is inevitable when two young WWII veterans, Henry’s brother, Jamie, and the Jacksons’ son, Ronsel, arrive, both battling nightmares from horrors they’ve seen, and both unable to bow to Mississippi rules after eye-opening years in Europe. Mudbound is a well-written novel that examines difficult topics and is wrought with much social and, at times, sexual tension and injustice. Jordan’s characters were diverse, and I felt that their voices were authentic. The book did suffer a bit because some of the characters seemed pigeon-holed and static. While the patriarch, Pappy, didn’t narrate any chapters, his vitriol and cruelty radiated from his every word and action. His son (and foil), Jamie, brought rays of sunshine into the bleak lives of those living in the dilapidated farmhouse. Jamie is struggling with his own demons after returning from the war but finds common ground with his neighbor, Ronsel Jackson. Ronsel, the son of black tenants on the McAllan farm, is also a World War II hero–until he arrives back in his hometown, a hotbed of racism and bigotry. Ronsel keeps forgetting his place down in the Delta, and his actions have devastating consequences, of which Jamie will be an unwitting party. While this wasn’t an uplifting or flawless novel, it is one that has merit and heart. It’s not an easy read and deals with many difficult–and a few superfluous–themes, but I would recommend it to those who are interested in Southern Fiction, books about struggle, or books that detail the reality of life in the South during the time of the Jim Crow laws. Southern Literature, especially when it offers commentary on social issues, is one of my favorite genres. Am I Suffering from Author Malaise? I love Southern literature too, so I’ve had this on my radar for a while and I was hoping to see you’d loved it. I think I’d still like to read it. This is one of those books that I keep around the house, with the hopes of reading it someday, yet I haven’t found the motivation to do so. Reviews of it seems sort of ho-hum. This is one of my favorites…I’d actually recommend it over The Help. Glad you enjoyed it. It brings a glow to my heart when someone actually enjoys a book I have recommended. I really liked Mudbound. Someone I worked with compared it to To Kill a Mockingbird. I don’t know that I’d go that far, but I did think Mudbound was deeply affecting. I liked that you could tell who was narrating which parts just by their voices alone. I got to hear the author read, too, and she was fantastic! i’d have to agree that while mudbound tells an interesting story, i don’t really think it’s quite in the same league as TKAM. that’s not to say that i didn’t enjoy many aspects of this novel, but i don’t think it will be the classic that lee wrote. I’ve kept hearing about this book over the past year. I suppose I should read it at some point. Nat, I will be honest. You know how much I miss your other blog which will remain unnamed, but I have adapted to the times. I often skip your book reviews – NOT b/c they aren’t great (we both know they are) but b/c I read so little contemporary fiction. I’m glad I clicked this one. I’m not a great fan of mod lit, but this sounds like a really intriguing read. I, too, enjoy southern places – you w/ your cousins, me with my mom & family, it’s natural. But I cannot abide some of what I find. This truly sounds like a book I’d enjoy – painfully, perhaps, but.. Thanks for the review. PS: Tell Ant Guillermo del Toro’s new book is supposed to be fabulous – has he read it yet? Another guest review?? i miss my other blog too, but felt CWG was really slipping because i was a bit preoccupied. lol. i loved the community we had–it was such fun–but i hate to do things half-assed so i had to break it off. it was me, not you. as for mudbound, i really did enjoy it and will send along my copy as soon as my mom and aunt finish with it. “It was me, not you.” Classic! As for the book, take your time — you can imagine things ar a bit hectic here at present w/ the chewing machine (aka Roxy). Right now she’s eating the trash can. Two days ago she nearly did in the bird. And no, I am not joking.. This is one that I really wanted to read when I first started hearing about it. But then I read a couple of less than enthusiastic reviews which made me second-guess myself. Now I’m thinking that I was right in the first place and need to grab a copy of this. Lisa´s last blog post ..Holiday Tag! Not necessarily something I would have picked up on my own, but it definitely sounds powerful. Well-written Southern fiction — especially historical — often captures my attention, too!